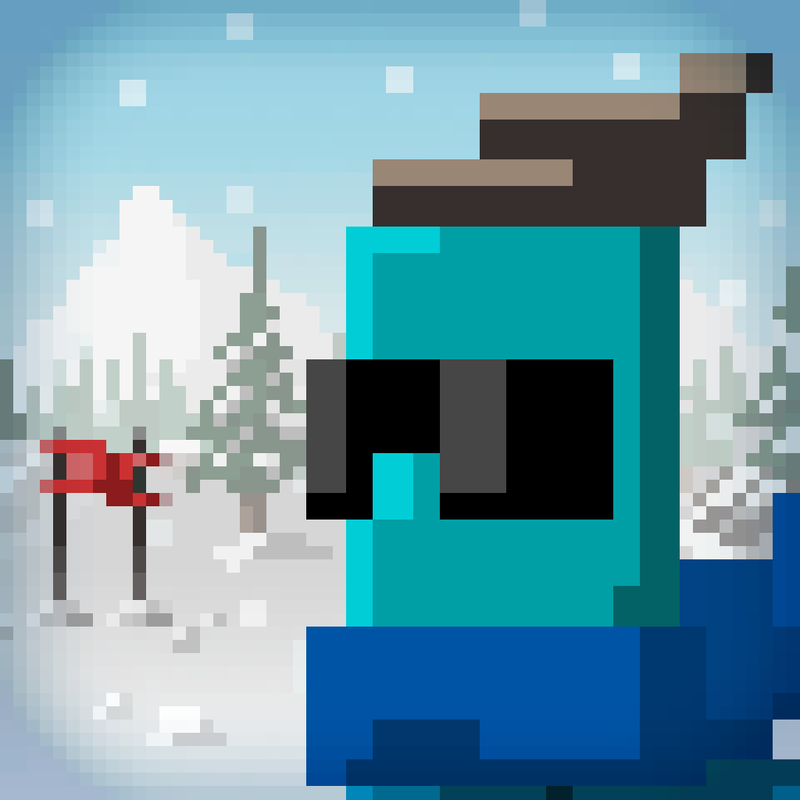 Dudeski ($1.99) by Static Oceans Corp. is a skiing game that will have you racing against the clock before you’re buried under a pile of snow. 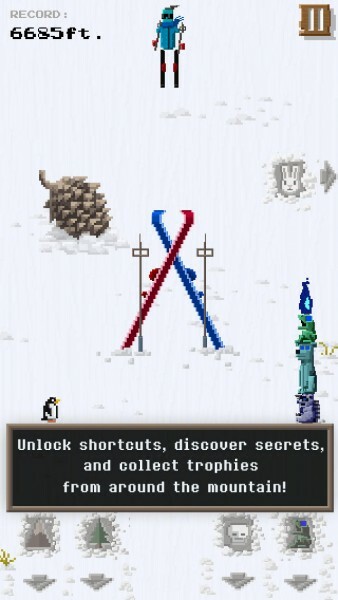 If you’ve enjoyed the classic computer game, SkiFree, then you’re going to have some nostalgia with this one. 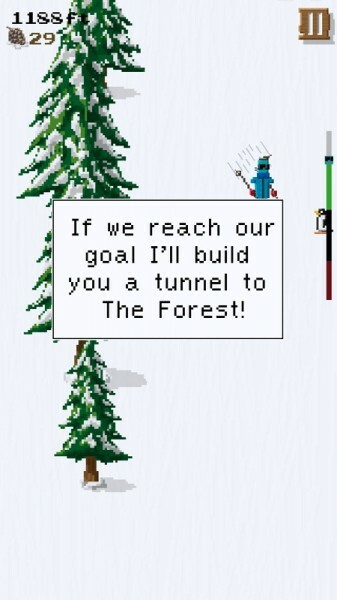 Back when I had an old Windows machine as a kid, I remember I always wasted time by playing those pre-installed computer games, like Solitaire, Pinball, and SkiFree. 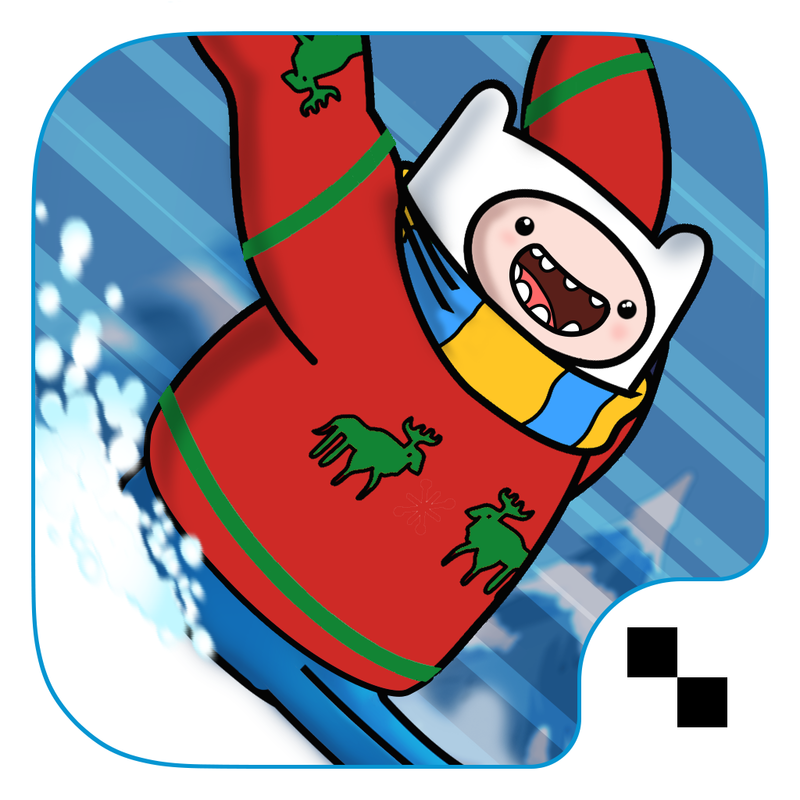 I believe that SkiFree was the first “endless runner” type game I’ve ever played, and I thoroughly enjoyed it every time I played. 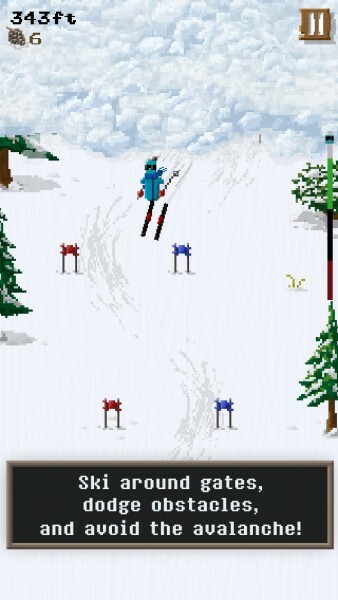 In fact, the few times I’ve gone skiing, I always just remember SkiFree, and go with it. 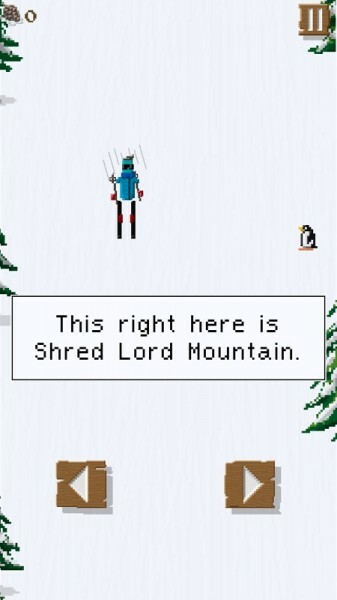 As I caught wind of Dudeski in the App Store, I was immediately reminded of my SkiFree days and knew I had to check it out for myself. 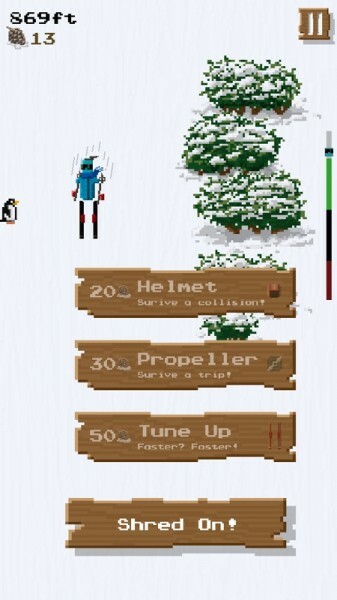 As if the SkiFree nostalgia wasn’t enough already, Dudeski features retro 8-bit graphics that are an absolute delight, especially if you grew up on the old-school consoles, like the NES. 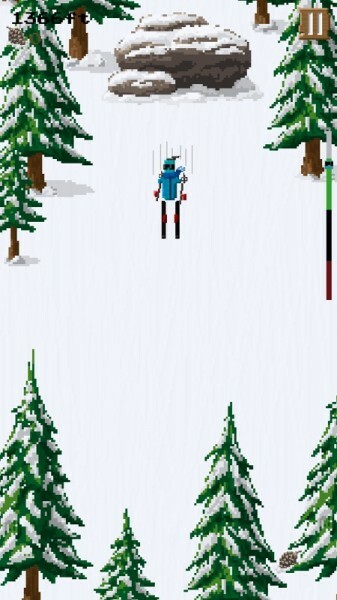 Despite the simplicity of these pixelated visuals, Dudeski features lush, detailed slope scenery, character models, and smooth animation. Think of having SkiFree on an NES, because that’s what this is making me think of, and it’s awesome. 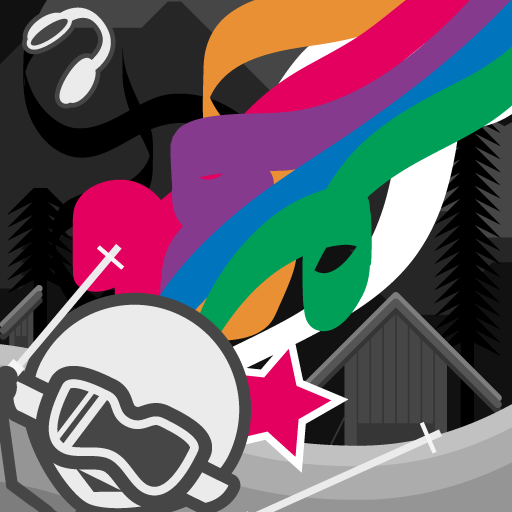 To top it all off, Dudeski sports a catchy and upbeat chiptune soundtrack, so grab a good pair of headphones and enjoy it. 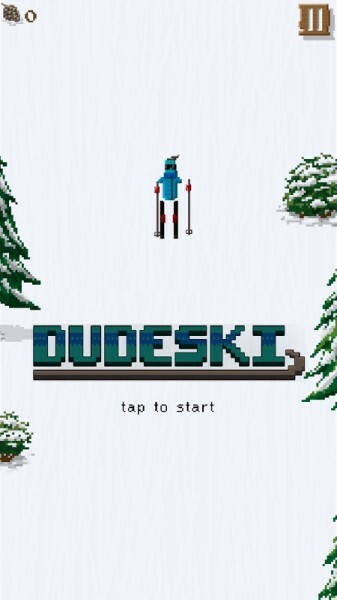 There is only one mode in Dudeski, as you would imagine — just ski down the slope of the mountain and avoid that nasty avalanche from the top. 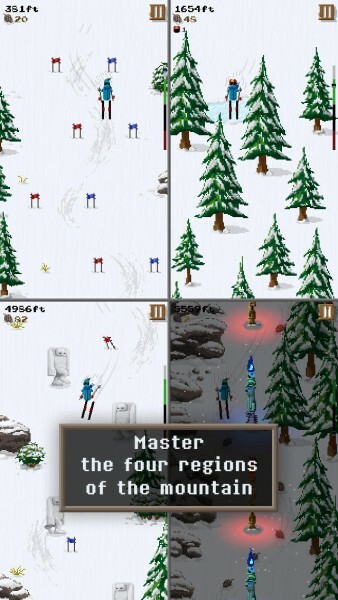 If you’ve ever played SkiFree, or even other modernized skiing games like Solipskier and Ski Safari, then you know the drill here. Even though there is only one mode, there are four different sections of the mountainside for you to enjoy and ski through, including the Yeti Valley and Totem Trials. And if you’re good enough, you can end up in secret zones, which are scattered across the mountainside, and each will have a shiny trophy for you to claim and prove that you conquered a (small) part of the mountain. 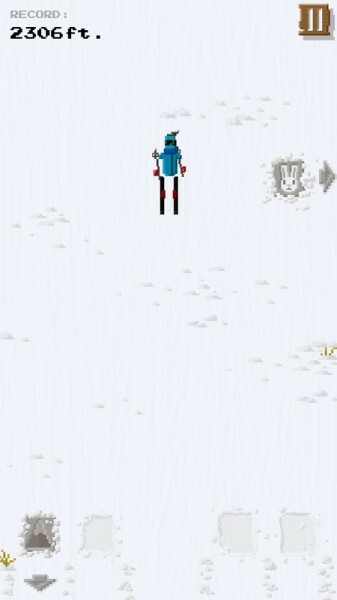 Controls are quite easy, with two on-screen buttons for moving your skier left and right. 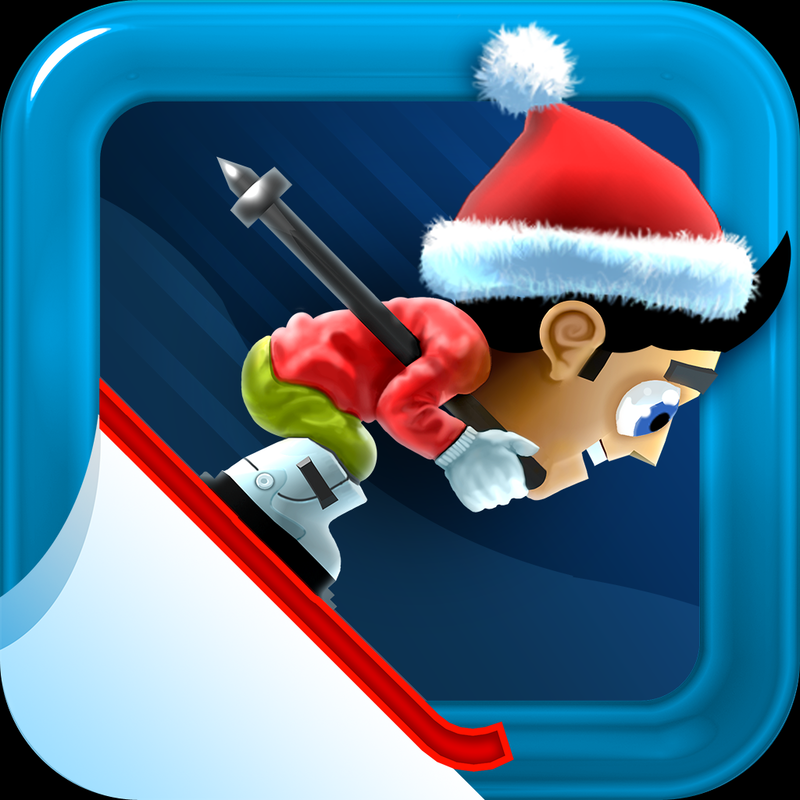 Of course, obstacles will get in your way while you go down, so you’ll have to tap on both of these buttons at the same time in order to jump over them. There will also be red and blue flag gates on the slope to indicate that you’re supposed to make your way through them (direction indicated with skid marks from previous skiers). 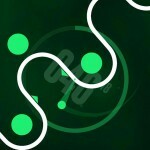 If you don’t make these turns correctly, or run the markers over instead, you’ll get a “thumbs down” indicator and your character is slowed down. I wasn’t too big a fan of this, because you really don’t get slowed in real life if you miss these things, but I suppose that this makes the game an even bigger challenge. As you make your way down, you’ll also find some pinecones along the way. Make sure to collect these, as you will meet some furry friends who, in exchange for pinecones, can get you gear to help on the run, or even find shortcuts through the mountain. 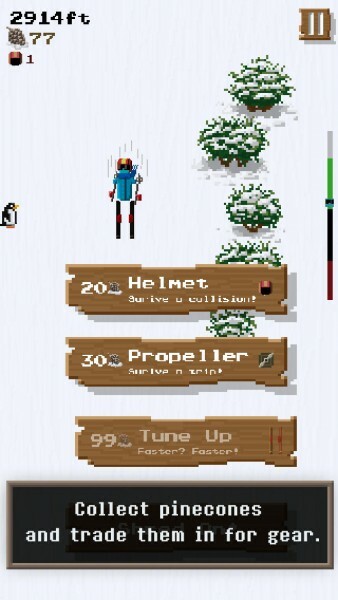 The equipment items in the game include helmets for protection, propellers, and tune-ups for going faster. 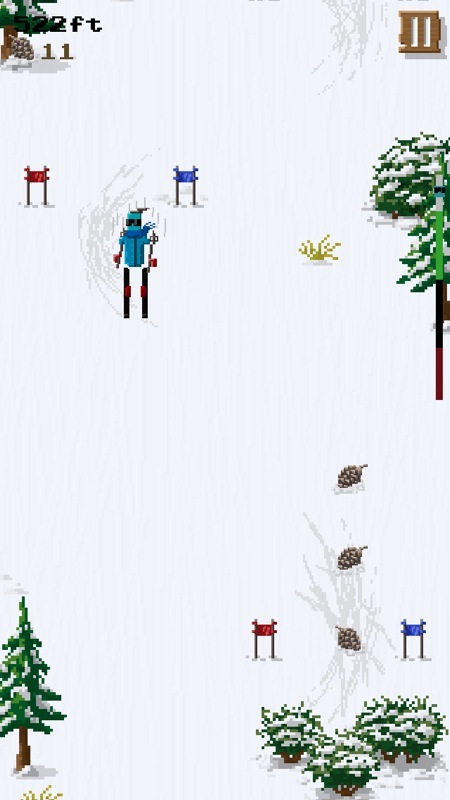 The game ends when you can no longer outrun the avalanche, and your score depends on how far you got on that run. There is also Game Center integration for leaderboards and achievements, which adds to the overall replay value. 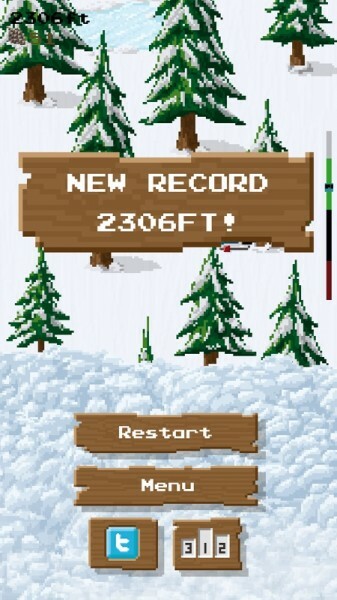 I’ve been enjoying Dudeski quite a bit since I downloaded it. 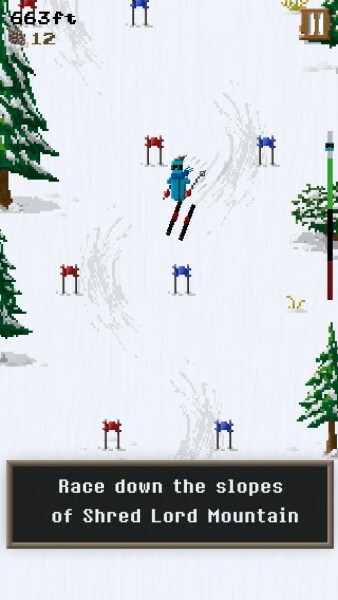 Not only is it fun and challenging, but it takes me back to my childhood with the basic SkiFree concept (there’s much more to Dudeski than SkiFree) and pixelated graphics. I also love the fact that the game is paid and has no in-app purchases, so all of the power-up items are obtainable just by collecting pinecones, and the rest is dependent on your skill. Just buy the game once and you get everything there is to it — this is how things should be. 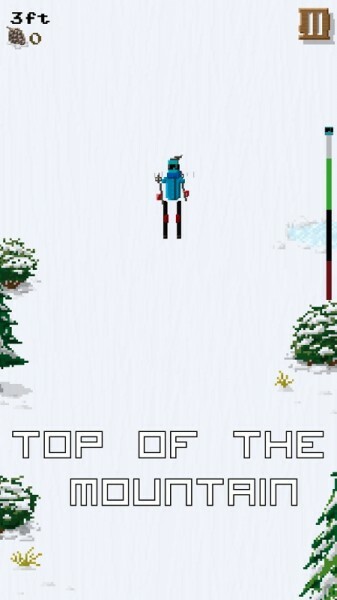 If you are looking for a challenging endless skiing game that plays homage to the classics, then look no further than Dudeski. 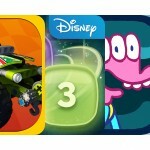 You can get it as a universal app in the App Store for $1.99.